Andhra style fish curry is a spicy and tangy fish curry made with chopped onion, tomatoes, spices and tamarind. The gravy pairs well with rice and roti. Marinate fish with 1 tbsp of ginger garlic paste, 1/2 tsp of turmeric powder 1 tsp of chilli powder and salt. Set this aside for 30 minutes. 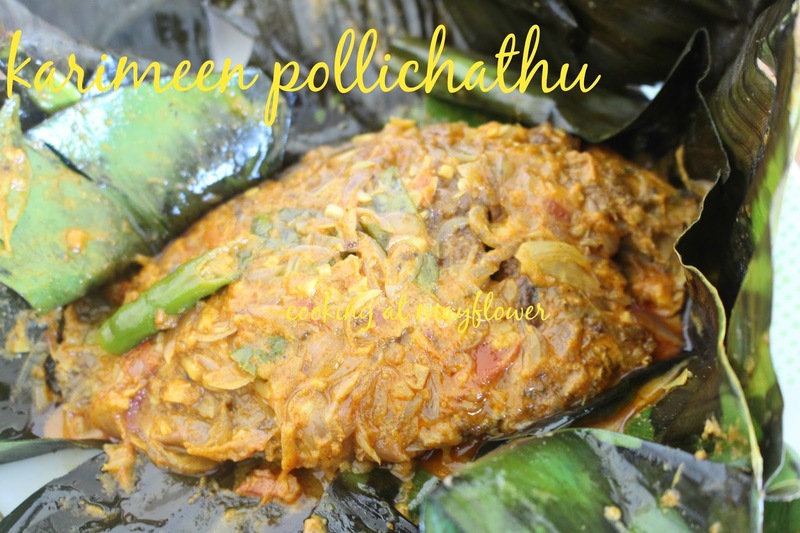 Heat a heavy bottom pan or earthen pot, splutter mustard seeds, cumin seeds, fenugreek seeds. Now add chopped onion, green chillies and ginger garlic paste. When onion turns translucent, add chopped tomatoes and salt. Saute well. When tomato turns mushy, add kashmiri chilli powder, coriander powder, fennel powder, pepper powder and turmeric powder. Saute well on a low flame. Now add tamarind juice, required water and boil for 5 minutes. Now add the marinated fish pieces and cook on high flame for 5 minutes. Then reduce the flame, close the lid, and cook for 15 - 20 minutes or until fish is cooked. Add salt if needed. Add chopped coriander leaves and serve hot with rice or chapati. Pictured :- Toddy shop style fish head curry / Meen thala curry , Rava fish fry. Clean the fish and make gashes on fish pieces. Marinate the fish pieces with turmeric powder, lime juice and salt. Keep this for 15-20 minutes. Make a paste of kashmiri chilli powder, red chilli powder, ginger garlic paste and garam masala powder by adding water. Now coat the fish pieces with the prepared paste. Mix rava and rice flour in another bowl. Now dip the fish pieces in the rava-rice flour mixture. Coat it well by patting the fish with the above mixture so that it is evenly coated. Heat oil in a pan. Now shallow fry the fish pieces on both sides on medium heat. Grind turmeric powder, mustard seeds, and salt to a smooth paste. Set aside the smooth paste. Clean and slit fish. Marinate fish with the paste and set aside for 15 minutes. Heat oil in a nonstick pan. In a medium low heat, shallow fry fish on both sides. Set this shallow fried fish aside. Grind red chilli powder, peppercorns, mustard seeds, shallots, garlic, ginger, cumin seeds and fenugreek seeds. Set this paste aside. Now pass the oil through a sieve to remove any fried specks of fish. Pour this sieved oil into an earthern pot along with the required amount of oil added in. Add onion and saute till it turns light pink. Now add chopped tomato. When tomatoes are all mashed, add the paste which is set aside. Saute till the oil starts to float on the surface. Add salt, vinegar, sugar, coconut milk and fish. Lower the heat and cook till all the water dries out and the gravy is well coated on the fish. Serve hot with rice. Clean and make slits on fish. Marinate the fish with pepper powder, chilli powder, turmeric powder, ginger-garlic paste, curry leaves and salt. Fry in coconut oil on both sides. When the first side is fried, flip the fish to get fried on the other side. Add some curry leaves also while flipping the fish. This will give the fish pieces a nice aroma and taste. When it is deep fried, transfer to a plate and serve with salad of your choice. Soak kokum in 1/2 cup of water for 10 minutes and keep aside. Heat oil in a clay pot. Splutter mustard seeds and fenugreek seeds. Saute shallots. chopped ginger. chopped garlic and curry leaves. When the color of the shallots start to to turn light brown, lower the heat, add coriander powder, kashmiri chilli powder and turmeric powder. Saute well. When the raw smell of the powder disappears, add kokkum along with the water in which it is soaked. Add required water. When it starts to boil, add fish pieces and cook for 3-5 minutes in high flame, the lower the heat and keep it for another 10 minutes. When the gravy starts to thicken, turn off the stove. Soak cambodge/kudampuli in 1/2 cup of water and keep aside. Crush small onion, green chillies, ginger, garlic and peppercorns. Keep this aside. 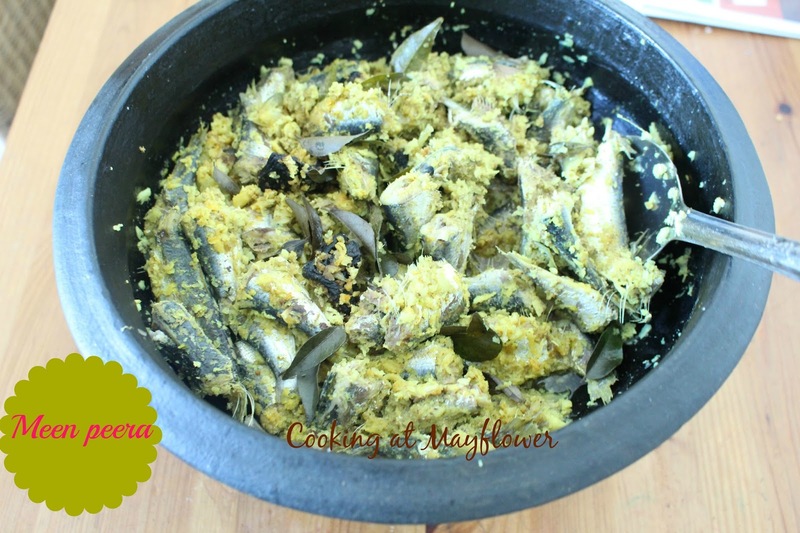 In an earthen pot, add cleaned fish, crushed ingredients, cambodge, curry leaves, salt, water and mix well. Cook till the bubbles come. Now lower the flame. When the gravy thickens, add thick coconut milk (Don't boil). You can add coconut oil over the curry if needed. Serve hot with rice.